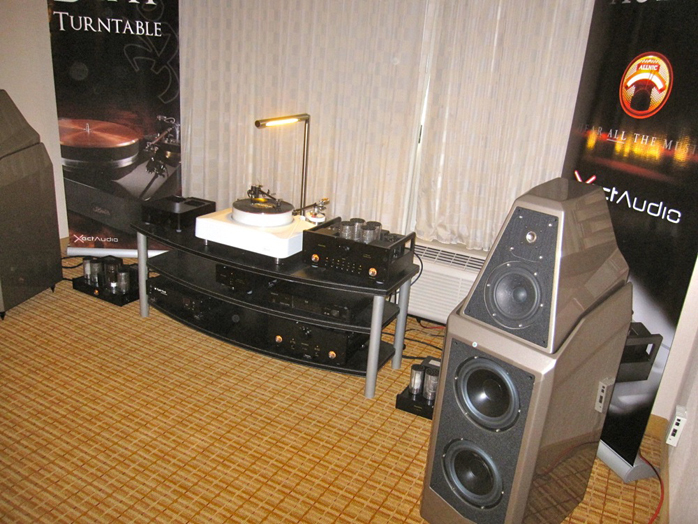 April Music, May Audio Marketing, Audes, Verastarr Cables: I honestly did not get much chance to listen in this room as the lovely Asian women here were handing product information sheets to me and then I spoke with the gentleman representing Verastarr Cables. 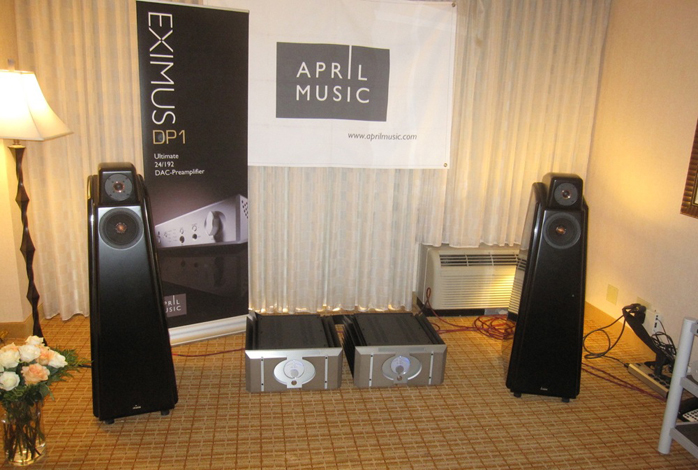 Like Stephen Meijas at Stereophile I was intrigued by the versatile and relatively affordable new April Music Eximus DP1 DAC/preamplifier ($2.995) just reviewed by Srajan. It has six digital inputs (including I²S, USB 2.0, 2 x 75-ohm coax, AES/EBU, three analog outputs, a headphone jack and is 24/192 capable. That’s a lot of functionality for this price. Amherst Audio, Blue Circle, J.M. Reynaud: Since the March 2011 passing of J.M. Reynaud, his son Jean Claude has taken the helm and according to Bob Neil of Amherst Audio made a change to the signature sound of their speakers. I can say that it is markedly for the better based on hearing the Offrande Supreme V2 two-way monitors ($7.500 including integral stands) being driven by a Blue Circle integrated amp. I always felt that the J.M. Reynaud speakers were musical, but not very revealing. This has changed radically. This system was exhibiting natural warmth whilst also being clear and revealing – a tough balancing act. The cymbals on the Branford Marsalis cut we played here were much better than in the Estelon room! However the percussion could not compete with what we heard from the Estelons. Branford’s saxophone was smoother with no edginess and the piano was great. Bob pointed to his Crimson speaker cable too which he feels is a real sonic bargain and contributes significantly to the sound. 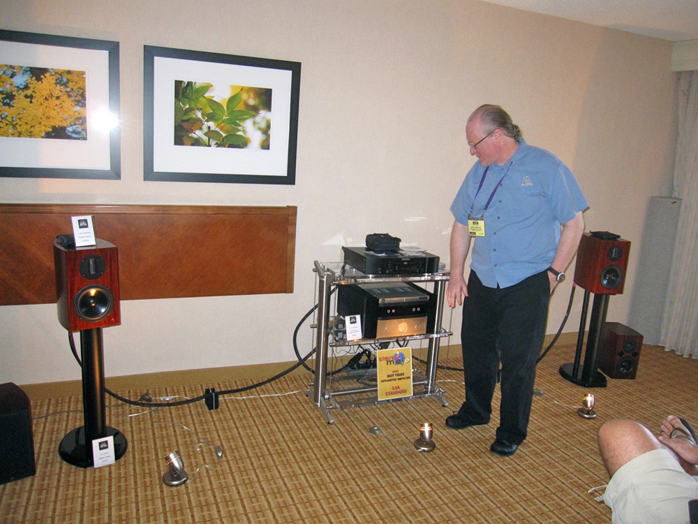 LSA Group: The LSA 1 Statement speakers were making great sound again this year. John Tucker who had a hand in their design was on hand. This speaker integrates an Aurum Cantus ribbon tweeter with a dynamic cone woofer as well as any speaker I have heard at any price. The ubiquitous Nils Lofren Keith Don’t Go was playing here too. I noted good decay on the guitar. It was very clear but perhaps a touch more raw than in some much more expensive systems. Still the dynamics are very engaging for a speaker this size. 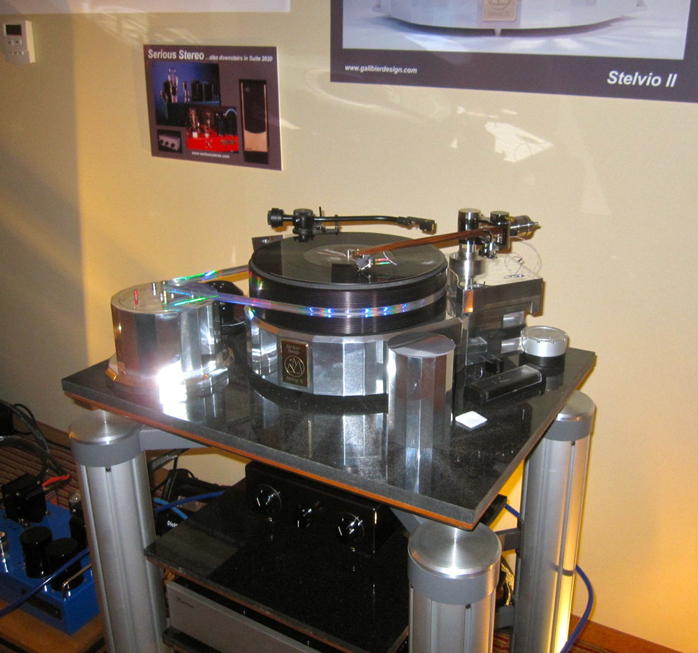 Xact Audio, KODO, Wilson, Reed tone arms, Allnic Audio: I got excited just looking at the gorgeous Kodo Magdrive turntable! 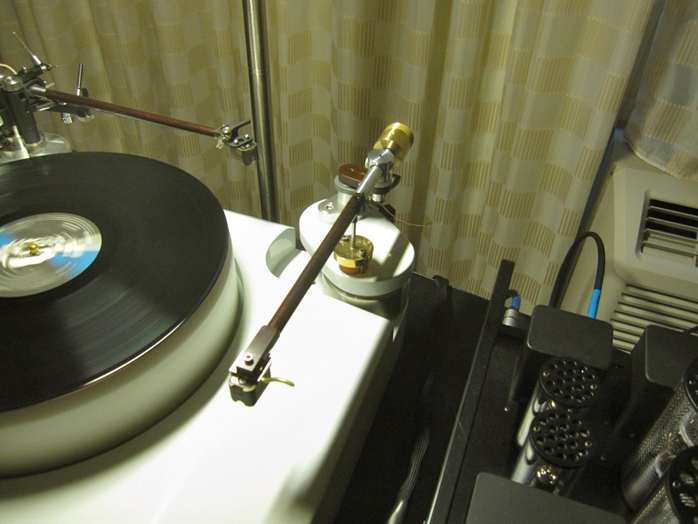 Top it off with a Reed tonearm and the debut of the new Schroeder linear tracking tone arm! I was about to burst at the opportunity to hear this demo. The Schroeder arm has an ingenious mechanism whereby the pivot point of the arm mounted on a cam is pulled out in an arc by the stylus to achieve tangency. 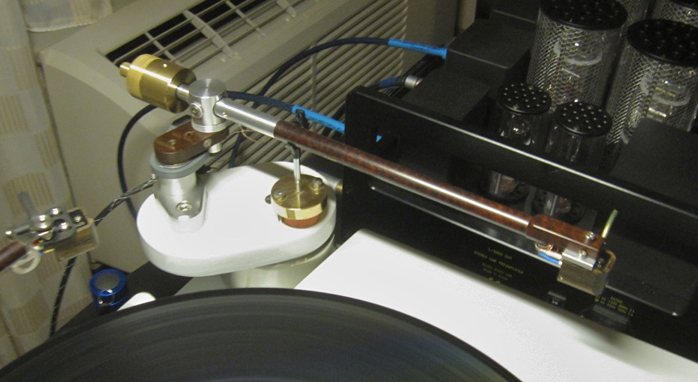 The ever-cordial Steve Dobbins provided us with a demo of the two arms playing the same cut both with an Allnic Puritas cartridge (broken in by the same amount of time). Dexter Gordon was the selected record. The Schroeder arm was more relaxed, had more body and better bass. There was a very noticeable difference on the trumpet climax and when the sound got complex, the top end of the Schroeder was just sweeter. This demo was one of the highlights of the show for me. Galibier Design, Kaplan, Serious Stereo, Daedalus Audio: Thom Mackris, ever the gentleman host, explained how this year he decided to use more of his own system’s equipment. 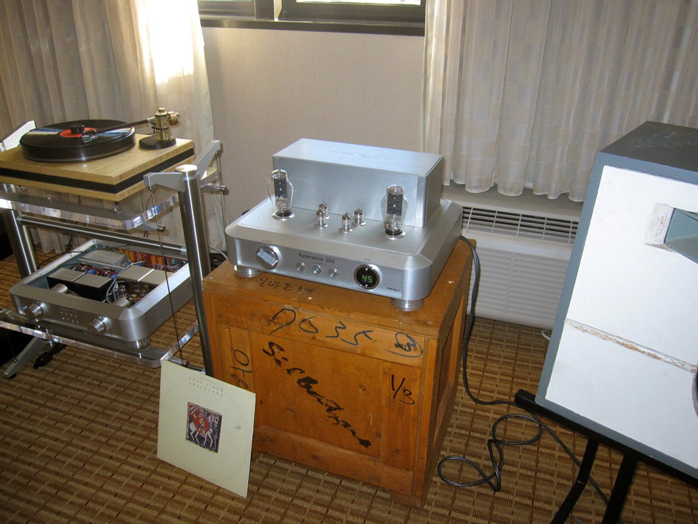 Rather than the Atma-Sphere MP-1 preamp and MP-60 amps of last year, Thom was using a Herron phono stage through a Serious Stereo custom passive attenuator into the Serious Stereo 2A3 amp. 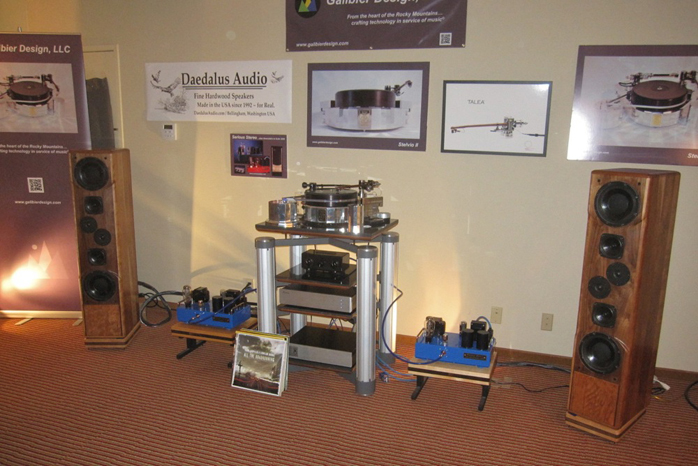 As last year the speakers were the Daedalus Audio Ulysses. Of course the featured component was Thom’s Stelvio II turntable with the Durand Talea II tonearm fitted with a Dynavector XV1s. While I think that the room gained some portrayal of nuance and texture with the 2A3 amps, I think there was also a tradeoff in the projection of the soundstage out in front of and outside the speakers. Still the case could be made for the Serious Stereo amps in terms of sheer naturalness and refinement. Despite their flea power I did not hear clipping or collapse on dynamic peaks. 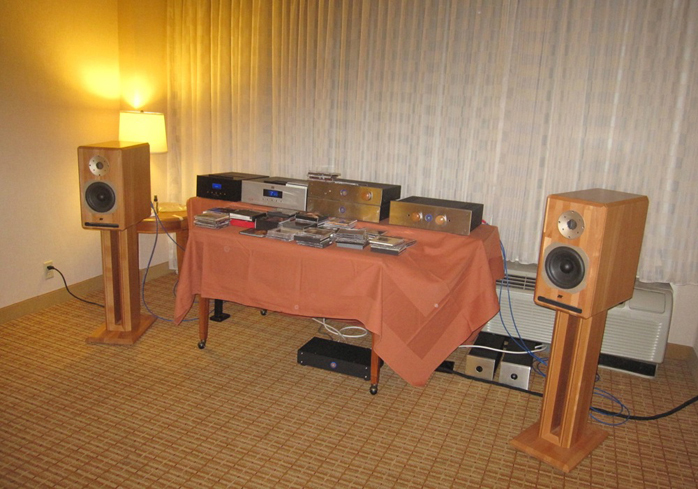 Upon Thom’s invitation I went back to his room for a very interesting Saturday night session in which we compared three phono stages:a modified Ayre, a Herron with and without Lundahl stepup transformers and a new K&K Premium Maxxed-Out ($2.799 assembled). There was great academic discussion after each change and everyone was given time to offer their opinions with Thom summing things up. I’m used to a bit less formal of a listening session but I respect the way Thom presided. Personally I favored the modified Ayre and many agreed. However the K&K made a good case for itself too. Thanks Thom! 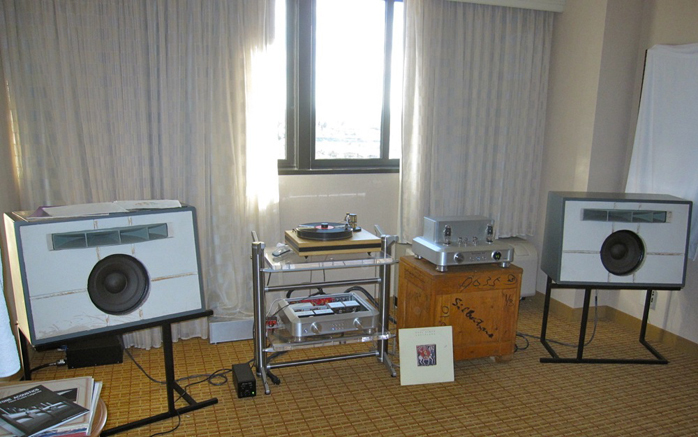 Silbatone, vintage Western Electric: Joe Roberts and a small crew of associates are having a blast with South Korean corporate sponsors and Western Electric collectors setting up vintage Western Electric speakers powered by modern Silbatone tube electronics. The ultra-rare Western Electric 757 studio monitors were a 1947 design and listening to them was like taking a trip in a time machine. 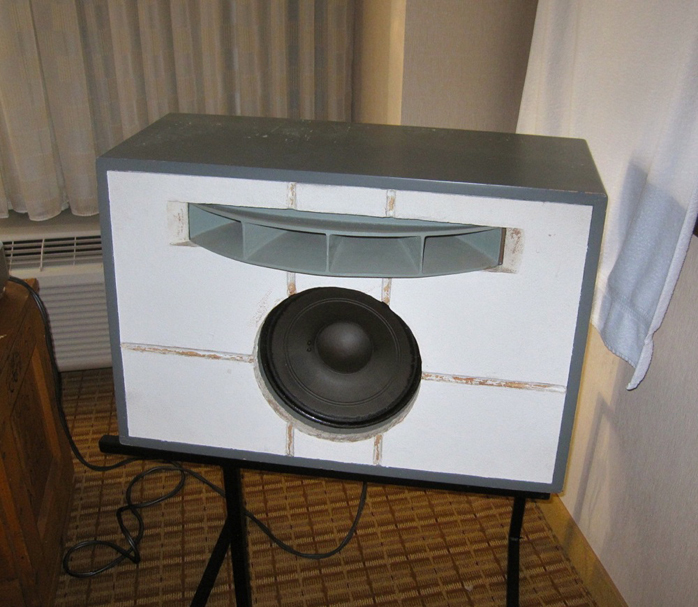 There is a directness to the sound that escapes many modern speakers. Everyone who heard them seemed to recognize this quality. It is an uncluttered sound stripped of artifice that gets the basics of the musical message so right. The LP selection was special too. I was totally charmed by Franco Corelli Sings Neapolitan Songs. On the vocal crescendo the speakers showed absolutely no sign of strain or spillover. Edith Piaf (whose records I have recently begun collecting) sounded marvelous too. This is the kind of room that every show goer should be made to visit. It is a touchstone in the history of reproduced music.